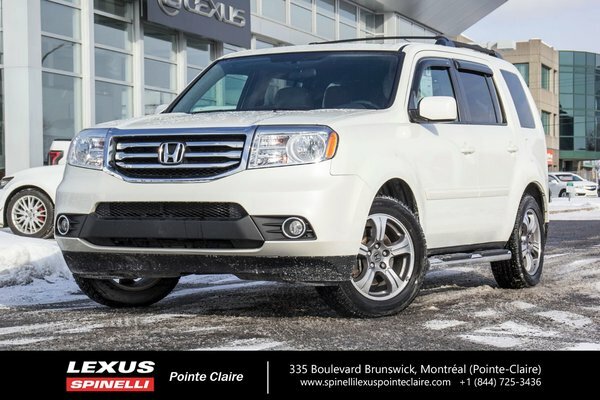 Here's a very clean 2015 HONDA PILOT SE with 83 820 kms. Our recently retired customer traded in this nice SUV along with a 2013 Honda CR-V EX for a 2017 Lexus RX 350. This 4X4 Pilot was originally purchased from a Honda dealer where it was inspected and serviced by their certified service department and inspected for re-sale by Spinelli Lexus Pointe-Claire. Never accidented. CARFAX vehicle history report available. Remainder of Honda warranty until September 29, 2019 or 100 000 kms. This Pilot SE comes with Toyo Observi GSI-5 winter tires on Honda OEM mag wheels AND Michelin MXV 4 4 season tires on RTX mag wheels. This truck also includes honda rubber floor mats and cargo tray, roof rack, chrome running boards, transparent film hood protector. Rear entertainment system DVD with wireles headphones.